OBJECTIVE To assess the reliability and validity of the 4-item SURE (Sure of myself; Understand information; Risk-benefit ratio; Encouragement) screening test for decisional conflict in patients. SETTING Four family medicine groups in Quebec and 1 rural academic medical centre in New Hampshire. PARTICIPANTS One hundred twenty-three French-speaking pregnant women considering prenatal screening for Down syndrome and 1474 English-speaking patients referred to watch condition-specific video decision aids. MAIN OUTCOME MEASURES Cronbach α was used to assess the reliability of SURE. A factorial analysis was performed to assess its unidimensionality. The Pearson correlation coefficient was computed between SURE and the Decisional Conflict Scale to assess concurrent validation. A t test procedure comparing the SURE scores of patients who had made decisions with the scores of those who had not was used to assess construct validation. RESULTS Among the 123 French-speaking pregnant women, 105 (85%) scored 4 out of 4 (no decisional conflict); 10 (8%) scored 3 (≤ 3 indicates decisional conflict); 7 (6%) scored 2; and 1 (1%) scored 1. Among the 1474 English-speaking treatment-option patients, 981 (67%) scored 4 out of 4; 272 (18%) scored 3; 147 (10%) scored 2; 54 (4%) scored 1; and 20 (1%) scored 0. The reliability of SURE was moderate (Cronbach α of 0.54 in French-speaking pregnant women and 0.65 in treatment-option patients). In the group of pregnant women, 2 factors accounted for 72% of the variance. 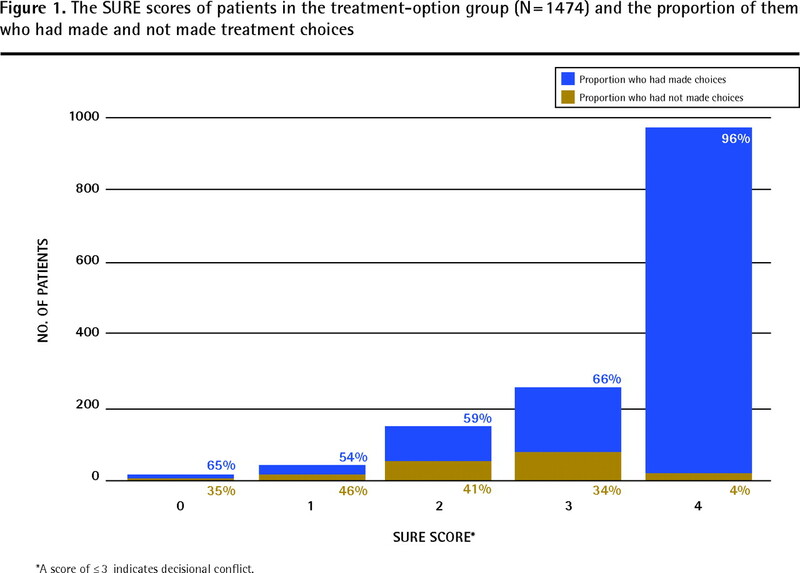 In the treatment-option group, 1 factor accounted for 49% of the variance. In the group of pregnant women, SURE correlated negatively with the Decisional Conflict Scale (r = −0.46; P < .0001); and in the group of treatment-option patients, it discriminated between those who had made a choice for a treatment and those who had not (P < .0001). CONCLUSION The SURE screening test shows promise for screening for decisional conflict in both French- and English-speaking patients; however, future studies should assess its performance in a broader group of patients. Decisional conflict refers to an individual’s perception of uncertainty about the course of action to take when the choices involve risk, loss, regret, or a challenge to personal life values.3 In lay terms, it indicates an individual’s level of comfort with a decision.4 The Decisional Conflict Scale (DCS)4 is a unique research-oriented tool that assesses decisional conflict in patients. Unlike the Physician Reaction to Uncertainty scale5 and the Ambiguity Aversion Medical scale,6 which were developed to assess the actors’ predisposition to uncertainty (a trait), the DCS assesses individual perceptions of uncertainty about which course of action to take (a state). The DCS counts 16 items and has been translated and validated in Dutch,7 French,8 and Spanish.9 The DCS scores correlate with scores for patient knowledge, treatment and screening intentions,4 and decisional regret,10 as well as the patient’s blaming of his or her doctor for a negative outcome.11 Physicians can use the DCS to reduce the downstream effects of unresolved decisional conflict by evaluating decisional conflict in their patients and providing appropriate support.12 However, the time required to administer the DCS discourages its use.13 For that reason, we sought to develop a tool that would help health professionals identify patients with clinically significant decisional conflict as quickly as possible. We accordingly developed the 4-item SURE (Sure of myself; Understand information; Risk-benefit ratio; Encouragement) screening test for decisional conflict in patients and used a 2-step process to assess its reliability and validity. We based our selection of the 4 items on core concepts of the Ottawa Decision Support Framework, which are relevant at all stages of decision making: feeling uncertain, feeling informed, feeling clear about values, and feeling supported in decision making.14 A fifth core concept (ie, the perceived effectiveness of the choice made) was not applicable to all stages of decision making. The wording of the French and the English questions was developed concurrently and framed in a positive manner to match the acronym SURE. The resulting 4-item test was field-tested with experts and graduate students taking clinical courses in decision support. Table 1 shows the French and English versions of the 4-item SURE screening test. The SURE test: A) English and B) French versions. A response of yes scores 1 and a response of no scores 0; a score of < 4 is a positive result for decisional conflict. Between April 2007 and December 2008, 2 distinct data-collection processes were performed in a stepwise approach, using convenience samples. The first group of consecutive patients consisted of French-speaking pregnant women who were considering prenatal screening for Down syndrome; they were recruited from 4 family medicine groups in Quebec city. Women were eligible if they were between the ages of 18 and 34 years, had no family history of genetic disorders, had not experienced pregnancies in which fetuses had suffered from genetic disorders, and were between 8 and 12 weeks pregnant. Women whose pregnancies were at risk were excluded. Patients were told that the study aimed at describing shared decision making in the context of prenatal screening. After their first routine prenatal consultations, the women provided sociodemographic information and completed a self-administered 16-item DCS. Each item was measured on a 5-point Likert scale (1 = strongly agree and 5 = strongly disagree). The women also completed the self-administered 4-item SURE test (Table 1) with 2 response categories: yes (score = 1) and no (score = 0). The second group consisted of consecutive English-speaking patients at a rural academic medical institution (ie, the Dartmouth Hitchcock Medical Center in New Hampshire) who were referred to watch condition-specific video decision aids as part of their standard process of care. The conditions addressed by the videos were chronic low back pain, spinal stenosis, herniated disk, hip osteoarthritis, knee osteoarthritis, prostate cancer treatments, early-stage breast cancer surgery, and breast reconstruction after cancer. The video for each condition provided information about treatment options, discussed the potential benefits and risks of each option, invited the viewer to consider the values he or she associated with each option, and reviewed the importance of patient involvement in decision making. After watching the video decision aids, study participants completed a self-administered questionnaire, which included the 4-item SURE questions. They did not complete the 16-item DCS. In both groups of patients, we performed descriptive data analyses and assessed the internal reliability of the SURE test by computing Cronbach α. The tetrachoric correlation coefficient was used to assess item-to-item correlations and the Pearson correlation coefficient was used to assess item-to-total correlations. Because decisional conflict is a state rather than a trait, it was not appropriate to assess intrarater reliability over time. Also, as the SURE test is a self-administered instrument, interrater reliability was similarly irrelevant. Factor analysis was performed using the principal components analysis method for factor extraction, with varimax orthogonal rotation. The number of factors retained was based on the minimum eigenvalue of 1 criterion. In the group of French-speaking pregnant women, we computed the mean DCS score by adding the values for all items, dividing the sum by 16, and multiplying the product by 25. The DCS scores ranged from 0 (no decisional conflict) to 100 (high decisional conflict). Previous research shows that women whose scores exceed 37.5 experience clinically significant decisional conflict.4 Totals of the SURE test were computed by adding the response scores of the 4 questions. We then assessed the criterion validity of the SURE test with the DCS by using a Pearson correlation coefficient—the hypothesis being that SURE scores would correlate negatively with DCS scores. (A perfect score on the SURE test indicates no decisional conflict; while a high score on the DCS indicates high decisional conflict.) In the group of treatment-option patients, treatment intentions were dichotomized (ie, those who made a choice about treatment versus those who were unsure about treatment), and SURE items were summarized as the frequency (percentage) of endorsed responses. Construct validity by extreme groups was assessed using a t test procedure—the hypothesis being that SURE would discriminate between patients who made choices of treatment and patients who did not. All calculations were performed using Statistical Analysis System version 9.1. Patients were not compensated financially. The study was approved by the institutional review boards of the institutions where data collection took place. We approached 180 French-speaking pregnant women registered at family medicine clinics in Quebec and requested their participation. Of these women, 21 were ineligible and 11 declined to participate. Of the 148 women recruited (response rate of 82%), 141 completed the DCS and 123 completed the SURE test. Table 2 summarizes participants’ sociodemographic characteristics. Of the 141 participants who completed the DCS, 7 presented clinically significant decisional conflict. Of the 123 participants who completed the SURE test, 105 (85%) scored 4 out of 4, 10 (8%) scored 3, 7 (6%) scored 2, and 1 (1%) scored 1. Patient characteristics: Mean (SD) age was 28.6 (3.51) years for French-speaking pregnant patients in Quebec and 59.3 (13.2) years for English-speaking patients facing treatment decisions in New Hampshire. The English-speaking patients in the treatment-option group were systematically distributed video decision aids and SURE questionnaires. A total of 1474 patients (34%) completed and returned the questionnaire. Of these 1474 patients, 981 (67%) patients scored 4 out of 4; 272 (18%) scored 3; 147 (10%) scored 2; 54 (4%) scored 1; and 20 (1%) scored 0 (Figure 1). Table 3 summarizes patients’ yes responses to the 4-item SURE questions. *A score of ≤ 3 indicates decisional conflict. The internal reliability of SURE was moderate (Cronbach α was 0.54 in French-speaking pregnant women and 0.65 in English-speaking treatment-option patients). In the group of pregnant women, removing 1 item (ie, support) produced a higher value (Cronbach α = 0.61). In the group of treatment-option patients, all item-to-item correlations were positive and ranged from 0.46 to 0.71. Item-to-total correlation results are presented in Table 4. In pregnant women, 1 item (ie, support) was negatively correlated with 2 items (ie, knowledge and values) and was poorly correlated with the total score. This item showed no variance in this group of respondents. As expected, in the group of French-speaking pregnant women, the SURE score correlated negatively with the DCS score (r = −0.46; P < .0001). Also as expected, in the English-speaking treatment-option group, patients who had not made choices about treatment (n = 225) had lower mean (SD) SURE scores than those who had (n = 1249) (2.6 [1.0] vs 3.6 [0.8], respectively; P < .0001). More specifically, among the treatment-option patients who scored 4 on the SURE test, only 4% had not made treatment choices compared with 34% of patients who had scored 3, 41% of patients who had scored 2, 46% of patients who had scored 1, and 35% of patients who had scored 0 (Figure 1). A factorial analysis of the SURE test in the group of pregnant women indicated that 2 factors accounted for 72% of the variance. Three items (ie, knowledge, value, and certainty) loaded under 1 factor. The other item (ie, support) loaded under the second factor. As expected, in the treatment-option group, 1 factor accounted for 49% of the variance. Our findings suggest that the SURE test has acceptable psychometric properties and is suitable for screening for decisional conflict in French- and English-speaking patients facing clinical decisions in primary care. As such, the tool can improve how decisions are made in family medicine, benefiting patient outcomes as a result. We expect this phenomenon to occur in a 2-step process. First, to the best of our knowledge, SURE is the only clinically oriented instrument that helps physicians identify patients experiencing clinically significant decisional conflict. In developing the 4-item test, our team drew inspiration from the 4-item CAGE questionnaire (Have you ever felt that you should cut down on your drinking? Have people annoyed you by criticizing your drinking? Have you ever felt bad or guilty about your drinking? Have you ever had a drink first thing in the morning to steady your nerves or to get rid of a hangover [eye-opener]?) used for screening for alcohol abuse in clinical practice.15 The literature reports that CAGE’s short format makes it more attractive to busy clinicians than the longer version and thereby increases its use.16.17 It is not unlikely that the 4-item SURE test will act similarly, making clinicians more willing to seek to identify patients experiencing substantial decisional conflict. Second, the downstream effects of unresolved clinically significant decisional conflict in patients4,10,11 suggest that the use of SURE in clinical practice has the potential to improve patient outcomes. In the group of French-speaking pregnant women who had consulted with their family physicians, testing revealed that 7 (6%) of them were experiencing clinically significant decisional conflict regarding prenatal screening for Down syndrome. This relatively high incidence suggests real benefits to coupling the use of the SURE tool with a decision support system so that positive test results (a score of 3 or less) trigger physicians to help patients make decisions or refer patients to appropriate resources. Notwithstanding the interest of our findings, our study has several limitations. First, we reported on data collections that occurred independently. The drawbacks of this procedure are offset by the fact that it produced a larger sample size with more descriptive data and better evidence of the tool’s acceptability (2 languages and 2 countries) than would otherwise be possible. It also allowed us to assess the tool’s relevance in different clinical situations. Second, in the group of French-speaking pregnant women, we observed a less-than-optimal value of Cronbach α and could not confirm SURE’s unidimensionality. This suggests that there might be a need to modify 1 item (ie, support). However, it is possible that the lack of variance in the SURE scores (most individuals had perfect scores) might have contributed to this observation, as the magnitude of a reliability coefficient is highly dependent on the homogeneity of subjects in a group. Thus, it is possible that we underestimated the true reliability of the SURE test. For this reason, it is important that future studies assess the performance of SURE in groups with a larger proportion of patients experiencing clinically significant decisional conflict. Results from this study suggest that the SURE test is suitable for screening for decisional conflict in French-and English-speaking patients with a variety of health conditions. Future research should assess the performance of the SURE test with a more diverse group of patients. Decisional conflict refers to a patient’s uncertainty about the course of action to take when the choices involve risk, loss, regret, or a challenge to personal life values. The 4-item SURE (Sure of myself; Understand information; Risk-benefit ratio; Encouragement) screening test was developed to help health professionals identify patients with clinically significant decisional conflict as quickly as possible. Results of this study indicate that the SURE screening test has acceptable psychometric properties and is suitable for screening for decisional conflict in patients facing clinical decisions in primary care. As such, the tool can improve how decisions are made in family medicine, benefiting patient outcomes as a result. Le conflit décisionnel désigne l’incertitude des patients entourant la marche à suivre quand leurs choix comportent des risques, une perte, un regret éventuel ou un conflit avec des valeurs de vie personnelles. Le test de dépistage en 4 volets SURE (sûr de soi; comprendre l’information; rapport risques-avantages; encouragement) a été conçu pour aider les professionnels de la santé à identifier aussitôt que possible les patients qui vivent un conflit décisionnel important sur le plan clinique. Les résultats de cette étude indiquent que les propriétés psychométriques du test de dépistage SURE sont acceptables et que ce test convient dans le dépistage du conflit décisionnel chez les patients aux prises avec des décisions cliniques en soins primaires. Comme tel, l’outil peut améliorer la façon dont les décisions sont prises en médecine familiale et, par conséquent, les résultats chez les patients. All authors contributed to concept and design of the study; data gathering, analysis, and interpretation; and preparing the manuscript for submission.
. Ottawa, ON: University of Ottawa; 2005. Implementation of the Ottawa Decision Support Framework in five family practice teaching units: an exploratory trial [dissertation].
. Managing uncertainty [Letters]. Can Fam Physician 2007;53:1000.
. Nursing diagnosis: application to clinical practice. 8th edition. Philadelphia, PA: Lippincot Williams and Wilkins; 2000.
. Validation of a decisional conflict scale. Med Decis Making 1995;15(1):25-30.
. Physicians’ reactions to uncertainty: refining the constructs and scales. Motiv Emot 1995;19(3):175-91.
. Perceived ambiguity about cancer prevention recommendations: relationship to perceptions of cancer preventability, risk, and worry. J Health Commun 2006;11(Suppl 1):51-69.
. The decisional conflict scale: further validation in two samples of Dutch oncology patients. Patient Educ Couns 2001;45(3):187-93.
. Cross-cultural validation of the Decisional Conflict Scale in a sample of French patients. Qual Life Res 2006;15(6):1063-8.
. Use of telephone care in a cardiovascular disease management programme for type 2 diabetes patients in Santiago, Chile. Chronic Illn 2006;2(2):87-96.
. Validation of a decision regret scale. Med Decis Making 2003;23(4):281-92.
. Will men attribute fault to their GP for adverse effects arising from controversial screening tests? An Australian study using scenarios about PSA screening. J Med Screen 2004;11(4):165-9.
. Risk communication in practice: the contribution of decision aids. BMJ 2003;327(7417):736-40.
. Prediction of health professionals’ intention to screen for decisional conflict in clinical practice. Health Expect 2007;10(4):364-79.
. A decision aid for women considering hormone therapy after menopause: decision support framework and evaluation. Patient Educ Couns 1998;33(3):267-79.
. The value of the CAGE in screening for alcohol abuse and alcohol dependence in general clinical populations: a diagnostic meta-analysis. J Clin Epidemiol 2004;57(1):30-9.
. Screening properties of questionnaires and laboratory tests for the detection of alcohol abuse or dependence in a general practice population. Br J Gen Pract 2001;51(464):206-17.
. Detection of alcoholism in the medical office: applicability of the CAGE questionnaire by the practicing physician. Group of Medical Practitioners PMU [article in French]. Schweiz Med Wochenschr 1995;125(38):1772-8. You are going to email the following Are you SURE? Can shared decision making increase the uptake of evidence in clinical practice?